Ever hear the saying that “a picture is worth a thousand words”? Thinglink is a free, user friendly web-based technology that allows you or your students to tell a story or convey a message relating to an important concept. 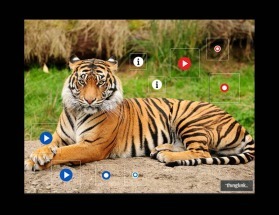 Thinglink is an interactive way to make your images come to life with video clips, text, images and more. For my Danielson teaching evaluation, I am teaching my colleagues about incorporating technology in the classroom and Thinglink was one of the technologies shared so I thought it would be great to share with you as well. Find out more about how Thinglink can be used in the FACS classroom and challenge yourself or your students to give it a try! Familiarize yourself with Thinglink by viewing a tutorial on it from SchoolTube. See video here. Note: It’s a great way to cut down on paper and art supplies especially if you are trying to save trees or go paperless. When teaching about the brain (lesson found here) and doing the “Build a Brain” project I had my students take a picture of the brain model they constructed, upload it to Thinglink and individually label it and create their poem, song or RAP. When teaching about the family and doing the culminating paper plate project (found here) I had my students upload a picture of their television family to Thinglink and add all of the required information by adding icons associated with their answers. Find or create a Thinglink for an independent study or scavenger hunt so students can learn more about a topic such as a specific food or culture, a region of the United States, etc. For example, here is one that I found on food science relating to “Molecular Gastronomy“. Note: There are some great, already constructed Thinglinks out there….all you have to do is search from the main site. Jennifer Brannon, a FACS teacher of Union County High School, Indiana created one on Temple Grandin and autism. You can even set up a class account and begin your school year or initial class by having students take a “Selfie” of themselves and upload it to Thinglink and add “all about me” info to their picture. Students can share and visit each other’s and fill out a background info sheet for each so students can learn more about their classmates. You can even make collages in fotor collages (referenced here) and have students save them and upload them into Thinglink and add all of the text info as well and share. Ex. Principles & elements of design, architectural design, etc. Finally, if you like your students to participate in station work, you could make a Thinglink for each topic with important information you want them to know or interact with and have students rotate through individually or with a partner. Ex. child development theorist, common birth defects, nutrients, etc.